I love a good barn door, so you can imagine how I smiled when I saw this one. This past fall, a MG friend invited me along as she picked up some plants from a friend. This lady is a GARDENER. She sells plants, and she maintains areas in her town. Everywhere I looked there was an interesting plant, a piece of garden art, or a fairy house that captured my attention. This door was no exception. Besides being a gardener in a league all her own, she is also a breast cancer survivor. As we toured her amazing gardens, she talked about her cancer journey. When she was talking about the many issues surrounding her breast cancer survival journey, she said something that stuck with me – just own it. 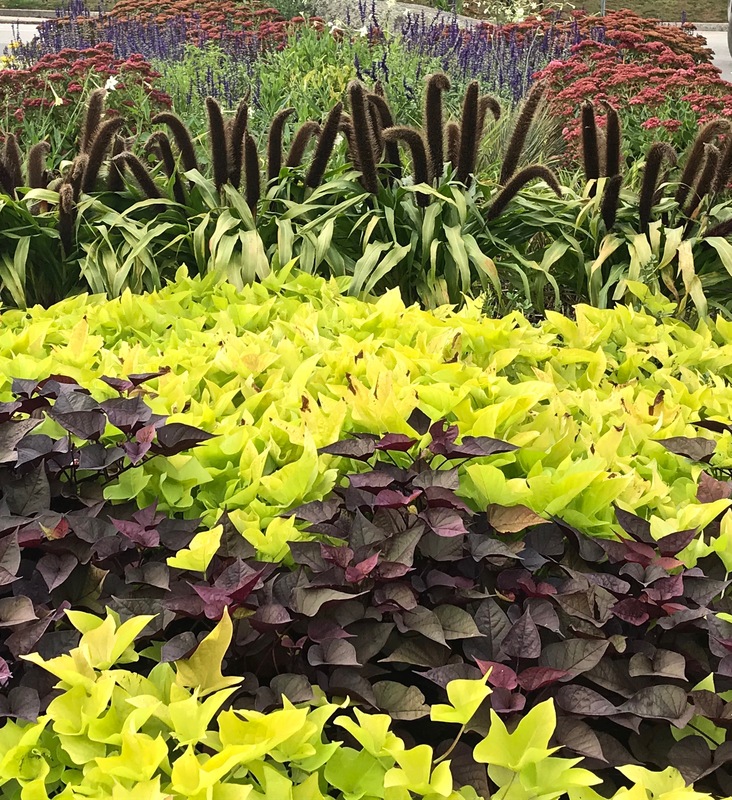 We had a great visit, and I came away with a lot of gardening ideas as well as a great thought when life tosses those inevitable curve balls. When spring arrives, I’m planning a return visit. With cash in hand, I hope I can pick up a few of her interesting plants. This bonus door was the original tack room in the barn. Our part of the state lucked out this week and received rain instead of the impressive snow fall that was dropped up north. Those folks moved a lot of snow and many were without power for several days. Hope you’re having a good week, and Mother Nature is treating you well. This entry was posted in Photography, Thursday Doors and tagged Barn Doors, Photography, Poinsettia Open House, Poinsettias, Thursday Doors. Bookmark the permalink. That’s a terrific door, Judy. I also really like the tack room door. The plants are beautiful, and it’s always good to hear a survivor story. Good luck at the Poinsettia Open House. Oh, that is beautiful. I like it and now want one of my very own. Door envy, that’s what I’ve got. A round of applause to the breast cancer survivor and her wonderful attitude, wishing her many years of good health and happy gardening. LOVE, LOVE, LOVE the barn door and the tack room door! Beautiful plants. The Poinsettia Open House must be gorgeous! Love the doors and the charming latches too! We’re cold here, with about 6″ on the ground. Winter just came so fast this year – ugh! I remember you showing the poinsettia display last year – the multitude of colors. For me, there’s only one, though: RED! Wish I could have some real ones inside, but with 6 busy cats I can’t take a chance. I’ve never been clear on whether or not they are poisonous! Great doors! This gardener sounds like a terrific lady. Enjoy your day dancing amidst the Poinsettias! Lovely post, lovely doors. And as a breast cancer survivor, I can certainly relate. Thanks, Judy! Having cancer certainly focuses the mind. It is heartwarming to hear how someone who obviously lives a rich and beautiful life survived to keep that going. Great door find. This door is a beauty. Good to hear you got rain instead of snow. Here summer has arrived a week early. My roses look amazing! Sadly, there are some devastating bushfires raging further north. Enjoy those beautiful roses. 🙂 I know you don’t get as much rain as you’d like, but I’m hoping Mother Nature might provide a surprise shower to help with the fires. They are so devastating and take so many years to fully recover. Storms are forecast over the fire areas in the next couple of days so hopefully they will get plenty of rain to douse the flames. That particular area is 1000 km further north of us in the state but there have been smaller ones closer to home. It’s very worrying and so sad to see ancient rainforest wiped out. Yes ma’am this is an absolute classic barn door – just perfect! Absolutely love that door! 😍 It seems the breast cancer survivor you met doesn’t waste a minute of her life .. and has a wonderful attitude, a lesson for us all ..my cousin is undergoing treatment for breast cancer at the moment, it certainly puts life in perspective.. Positive thoughts and prayers for your cousin. May she own the experience and kick it to the door as soon as possible. That barn door made me smile too. Glad you had such a good visit with your very creative master gardener friend, and felt uplifted by her story. Life does throw us such curveballs, doesn’t it? We have to find a way to survive, and if possible, to thrive. The wonder of the garden is all that it teaches about life. Gardeners teach too. I have a thing about polka-dots — love ’em! — and so that door with that chicken with those polka-dots just started my day in the best possible way. A great post! Thank you! I like how she uses those bright yellowish greens to get a pop of color! 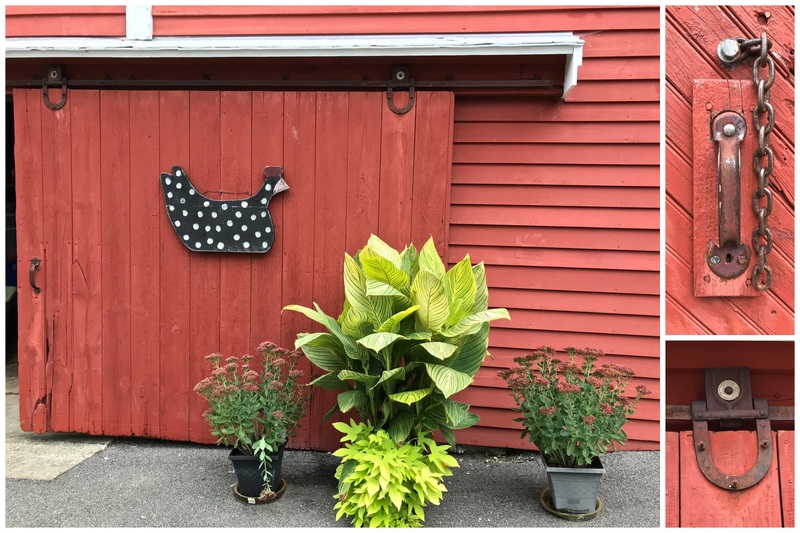 The barn doors are amazing–this person pays attention to every detail! In my opinion, there’s nothing better than a big red barn! The little chicken is icing on the cake! “Just own it.” What a great way to face life’s challenges head on. If that red barn door doesn’t stop you in your tracks, the hardware will! Nice! Like the old white one, too. Glad you enjoyed your outing with GARDENER and I hope you get some good stuff come spring! These are great doors. Aren’t Master Gardeners wonderful. My older sister is one. She has taught me loads! Sure thing! I look forward to reading your blogs.